Are you bothered by your double chin? Do you feel as if it makes you look older or overweight? If you’ve answered “yes” to any of these questions, you are not alone. 67% of individuals are struggling with submental fullness. There are three causes of this unwanted submental fullness. 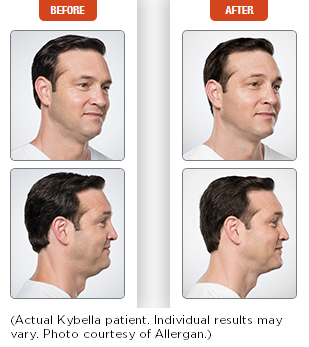 Kybella is the only FDA approved injectable treatment to improve the appearance of moderate to severe submental fullness. Kybella is made from Deoxycholic acid, which is a naturally-occurring molecule in our gut that helps to break down the dietary fats we consume. 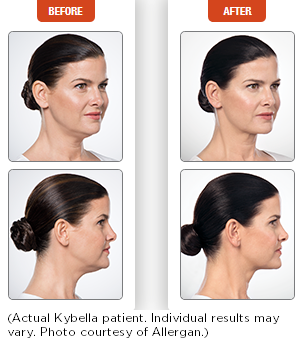 When we inject Kybella into the fat beneath the chin, it destroys the fat cells. The area can no longer store the fat, so the treatment process provides virtually permanent results. 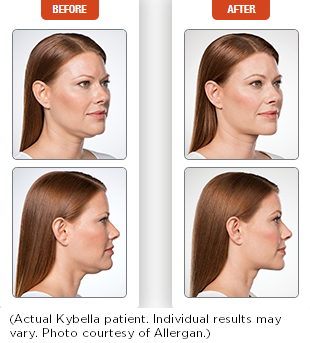 Kybella is an office procedure, and usually takes about 15-20 minutes. Topical numbing cream is applied to the area before the procedure and an ice pack is applied immediately after the injection, to minimize the discomfort. Common adverse reactions are swelling, bruising, pain, numbness. They are self-limiting. When Kybella breaks down the fat cell, it creates an inflammatory response, which causes swelling. After the inflammation is gone, it helps to tighten the skin. How Many Kybella Treatments Will You Need? Number of treatments needed depend pm amount and distribution of your submental fat and your personal goal. The average is about 2-6 treatments. The best way to see what Kybella can do for you is to schedule an appointment with Dr. Jao. She will answer all of your questions and help you understand the possible results from this treatment. Give us a call at (714) 930-1351, or send us an email through the contact form!